Known as Lake Arrowhead’s only creek side cabin resort, Arrowhead Pine Rose Cabins are easy to get to and hard not to enjoy! Pine Rose has about 20 cabins to rent, each with its own unique style and amenities. Nearby in walking distance you’ll find the rustic and romantic restaurant The Grill at Antler’s Inn, as well as the Mountain High Market that stocks basic grocery necessities. Just behind the Pine Rose resort property, you’ll find about a million acres of San Bernardino National Forrest where you can hike your socks off. While their cabins are not in walking distance to the lake, it is just a short 10 minute drive down to Lake Arrowhead and all the action. 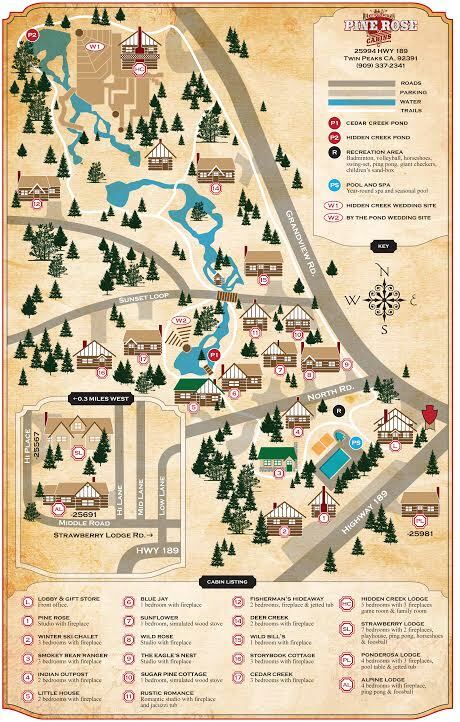 When searching to rent a cabin in Lake Arrowhead or Twin Peaks, the Pine Rose Cabins should definitely be on your list.